THEIR decision to rule out a comeback has left fans devastated. But Westlife’s Kian Egan said the reason they’re so adamant about never getting back together, is to prove to fans it’s no gimmick – they’re ready to get on with their lives. 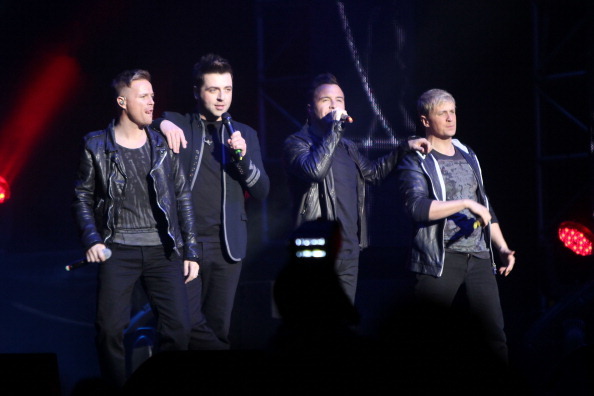 Speaking exclusively to OK.co.uk after Shane Filan, Mark Feehily, Nicky Byrne and Kian shocked the world of pop by announcing their split, Kian told us that following the Farewell 2012 tour – Westlife will be over for good. “The reason why [the split sounded] so strong was because we didn’t want people to think this was a break-up gimmick,” he explained. “That’s why we’re saying this is it, this is the final thing. Next year’s tour really is it. We’re not all of a sudden going to do a reunion in two or three years time. And while their decision has left their fans reeling, Kian said it “felt good” to finally break the news. “We’ve been living with this for a quite a while and we’ve spent quite a bit of time talking about it for last few months,” he told us. “It felt pretty good to be honest. We all knew that we were making the right decision. And it’s made everything else really enjoyable, you know? The pop crooners have had a staggering 14 No.1 hits, seven No. 1 albums and 10 sell-out tours over the past 14 years, which – as Kian admits – has made it difficult for them to fully-appreciate the extent of their reign in pop. “The reality is it hasn’t hit us at all,” he smiled. “We’re still at the top of the wave. “[It'll probably hit us] this time next year. I don’t think we even know what we’ve done in 14 years. The 31-year-old said the boys, much like their fans, will have to go through a period of mourning once it’s all over. “I think we’re going to have to go through a grieving process to be able to reflect and go ‘oh, it was amazing,” he mused. “I keep telling myself, ‘Kian you’re in a boyband, you’re not saving the world. You’re not the lead singer of U2! For now, Westlife are focusing on their Farewell tour, which kicks off next May, but they haven’t neglected thinking about their careers beyond that. “We’re all going to do something, we’re not all going to go home and sit on our bums for the rest of our lives!” he laughed. “We’re still young guys. I think Shane and Mark are two world-class singers – which is one of the reasons why we’ve stayed together for as long as we have – so it would be foolish to not go out there and start recording solo albums. Kian, who’s just welcomed a baby boy with wife Jodi Albert, said he’s the most blase one of them all when it comes to the future. “I just want it to happen naturally,” he said. “I have no idea what I’m going to do. And, he added, while there will never be a big comeback for the boys – it doesn’t mean they won’t ever perform together again. “It’s not to say that we won’t stand on the same stage again, in fact it’s probably odd to think we’ll never stand on the same stage again.